I have to admit it, I snatched the name for this blog from a book that helped my daughter get through high school history – Lies My Teacher Told Me. The original book was about the most common incorrect information that is found in history text books. And it was important enough to earn a Wikipedia entry and is well worth the read. My point is really not that far from the original book. Some of the information that I have heard or seen in museums has been really awesome, and some of it has been patently wrong. Do not hesitate to question the accuracy of information that you see in museums. My first really glaring experience occurred in the Victoria and Albert Museum, probably about 15 years ago. I was in the Medieval gallery, a general collection of Medieval artifacts ranging from monstrances, to mirror cases, and enameled spoons to reliquaries. I was examining the designs on a reliquary when I heard an authoritative woman’s voice behind me. She was obviously giving a tour of some sort, so of course, I listened, and glanced over my shoulder. The speaker was a distinguished looking matron. Her guests were a young couple, probably in their early 30’s, and obviously upper crust – my instant thought was “donors”. And their eyes were wide with delight at all the marvelous things that they were seeing. I love enthusiasm for historical things, so I continued to listen. And then the words came, “They made these bowls out of bronze because gold would melt if they tried to enamel it”. I never heard another word. My brain was racing. This information was totally wrong. Should I speak up? No. I decided that these folks were probably not even going to remember that casual comment, and if I spoke up I would just be an “obnoxious Yank” and even more important I might affect the long term donor status of the young couple. Donors are the life blood of most museums. It just wouldn’t accomplish anything positive. So, one of the basic rules that we always have to remember is that science – chemistry, physics, metallurgy, and all the other branches of science, operated according to the same rules in ancient times as they do now. What I knew was that most enamel, especially the often heavily leaded enamels that were used before the 1990’s, melt at between 1100 and 1400 degrees Fahrenheit. Bronze, which is what the bowls were made of, melts at about 1980 degrees Fahrenheit, and Gold, depending on the alloy, melts at about 1948 degrees. Hence, the docent’s statement was really, really, wrong. The bowls were made of bronze to save money. After they were made they could easily be gilded, to make them look as if they were made of gold, without having to pay for the additional cost of solid gold. Sigh. 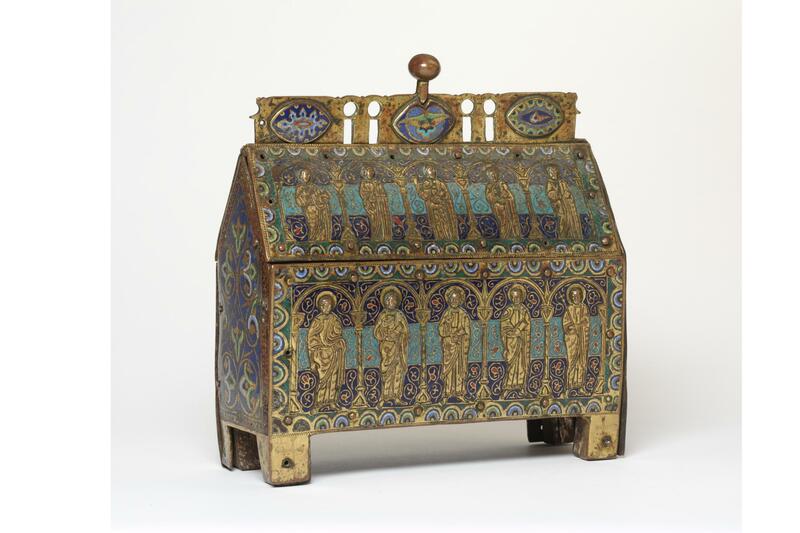 And just for fun, here is one of the reliquaries from the V&A. What other sorts of things should we be watching for when we go to museums? Generalizations are always a “red flag”. Statements like “The Romans always…” There are very few absolutes when it comes to people. Next time: Other Hints to Help us Navigate Museum Exhibits. This entry was posted in Archaeological Finds, Metal Casting, Research and tagged museum research by Eirny. Bookmark the permalink.